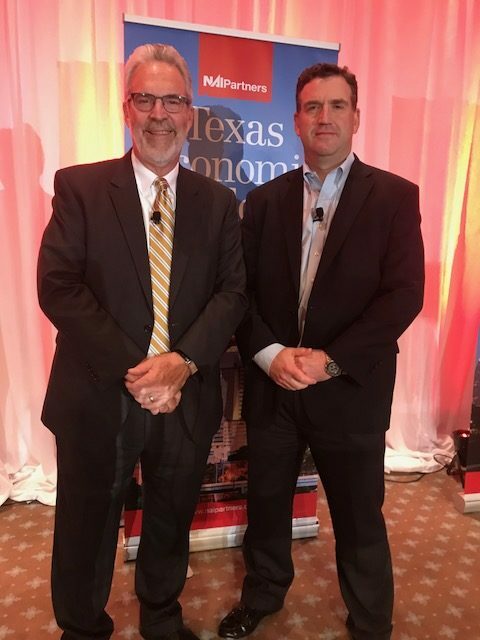 Economist Mark Dotzour and Jon Silberman of NAI Partners at the firm’s Texas Economic Outlook. HOUSTON – (By Michelle Leigh Smith) – Houston is a beast with a tough hide and spirit that won’t give up when the going gets tough, says economist Dr. Mark G. Dotzour. Dotzour, the keynote speaker at NAI Partners recent annual Texas Economic Outlook, praised the resiliency of the Houston economy. Dotzour is a real estate economist who served for 18 years as Chief Economist of the Real Estate Center at Texas A&M University. He reviewed the recent history of the nation’s economic cycles, comparing 2006 to the overheated engine of a hot rod that was about to explode. There was some recovery and before the Presidential election, last November, the U.S. economy was growing at a rate of about 2 percent. But the economy improved. “Now, this country is on fire,” Dotzour said. Jobs are available and companies are looking for workers, he said, a sign of a healthy economy. Across the nation, according to the Bureau of Labor Statistics, the nation recently had a total of 6,163,000 available jobs, including 75,000 government jobs, 388,000 manufacturing jobs, 225,000 construction jobs, 1,208,000 professional and business jobs, and1,040,000 trade, transportation and utility jobs. Jon Silberman, Managing Partner of NAI Partners, welcomed the crowd to the Houston Country Club. He delivered some optimistic remarks, a direct reflection of the shared optimism in the ballroom in the wake of the most devastating storm the region has ever experienced. “It’s been an interesting couple of years and I think Houston is on a great track,” said Silberman. “We placed $30 million in acquisitions in 2017 and we’re looking to do a lot more than that. “ He thanked the firm’s clients and event sponsor Q10 KDH Kinghorn Driver Hough & Co.
Dotzour has given more than 1,450 presentations in his career. In 2015, Dotzour stepped down from his position at the Real Estate Center to focus all of his time and effort on analyzing current economic conditions and communicating his analysis to others. After earning his PhD in finance and real estate from the University of Texas at Austin in 1987, Dotzour was a tenured professor of real estate and finance at Wichita State University in Wichita, Kansas for 10 years. NAI Partners, one of the largest Houston area commercial real estate companies. The company has offices in Houston, San Antonio and Austin.